Gliffen has recently consolidated ongoing and critical tasks to ensure the quality and health of your web site into a 12 month package offering. 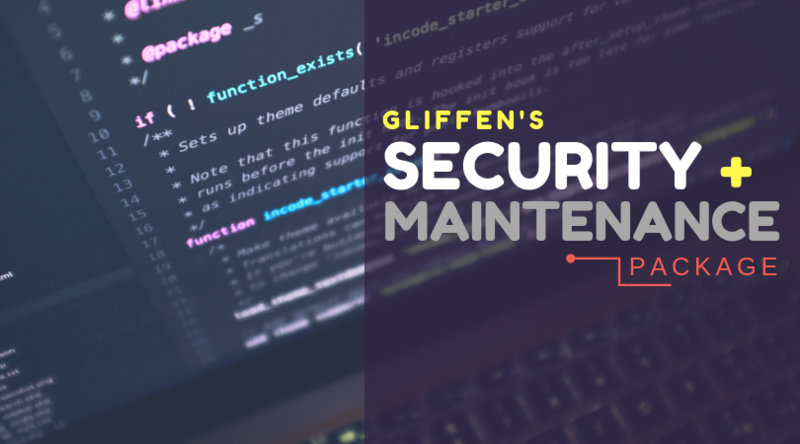 The total package includes monthly security monitoring, an allotted amount of minor edits to your site, and a private CDN, in addition to, hosting on Gliffen’s servers. Gliffen will discern if edits requested will exceed 1.5 hrs and, if so, the client will be charged according to contracted hourly rates. If hours are expected to be exceeded, Gliffen will notify the client first before proceeding with requested changes. A CDN will be put in place for the client’s website in order to use the power of cached versions of the website in multiple geographical locations. This will improve page load speed and optimize the performance of the website for the visitor. 250 GB per month will be allotted to the website, overage charges may apply if the 250 GB limit is exceeded. With upgrade to our Premium package for 12 months at a time, your website will receive hands-on management (all server notifications will be sent to Gliffen Designs), cPanel account with administrative tools for site, secured VPS (Virtual Private Server) firewall, advanced server features, and weekly off-site backups. With the Hosting and Monitoring Services Package, a one year commitment is required. Billing options are an annual cost of $1,500 or a payment of $800 every six months. Any third party costs will be paid directly to the vendor by the client or paid by Gliffen and passed along to client for reimbursement. The following third party costs are anticipated: paid plugin renewals (if needed). Contact our project management team today if you would be interested in partnering with Gliffen for a web project or upgrading the services for your site!